I was sitting on the bleachers at my daughter’s volleyball practice last night. I spent the first part of practice trying to pay attention to the drills and skills they were attempting to master. I wasn’t entirely successful. I am one of those people who reads all the time—I don’t mean just books, magazines, or newspapers. I mean anything. If I am alone at the breakfast table I will read the cereal box. Peruse the menu at restaurants or any table top info available. Public transportation advertising. If it’s readable I am going to read it. So as I watched these 4th and 5th graders practice my mind wandered a bit and I began reading the text on their varied t-shirts. Girl Scouts. Camp. Glee. Nike swoosh with some text on the back of the shirt. I go back to the Nike swoosh with the text on the back of the shirt. I am not sure I read it correctly. The words have enough impact on me that I write them down. I don’t want to keep staring at the back of this girl’s shirt. The anti reading, writing and arithmetic viewpoint is initially what is most obvious. The antithesis to the renewed national push for a STEM-focused curriculum in the schools. But as I read the words I have written down a second time I get a far different read on them and one that I find frankly misogynistic. The shirt is pink. It’s obviously geared to girls. It makes its message quite plain that schoolwork is boring and unacceptable. But that last line—that “just cheer” message—I find devastating. It’s not only purveying the message that homework, science, math, what have you is not cool; it’s also broadcasting the message that your job as a girl is to sit on the sidelines and cheer. Not be in the thick of things. Not be the one out there on whatever field of play you choose. Just cheer. This strikes me as an intentionally damaging message to pre-adolescent girls. The negativity over schoolwork, at a time when these preteens are so impressionable, is criminal. This message, Just Watch!, instills in our young girls the idea that they are, should be, just observers in the game of life. I know cheerleading is a sport and a dangerous one at that. I have seen their soaring athletic feats and also the attendant related injuries. Believe me I am not knocking cheerleading in itself. But this message isn’t really about cheerleading. It’s about sidelining women and limiting their options; a contradictory message offered by a giant corporation making billions from women’s sports. Is this “advice” intended for the girls and women in the audience? Is it to prepare their minds and attitudes for when they take their “rightful place” in the kitchen? However you read it, it’s unacceptable. But even here you read the condescension towards women as the construction is passive, weak, even begging, for this allowance. I’m fairly certain the athletes used in the ads are not passive and weak and surely none of those female role models would sideline their aspirations for excellence. Even with this economic turndown Nike posts profits–but still gets away with propagating a sexist message. But it isn’t just Nike. This morning a friend happened to forward an email to me from CREDO. CREDO is a mobile, credit card and long distance phone company that donates a portion of its income to non-profits. According to their website they champion various causes relating to the environment, equality and human rights. The email forwarded by my friend was in regard to two t-shirts–one sold by Forever 21 and the other by JC Penney. CREDO found these shirts offensive and was championing an email campaign to these companies. Girls that age don’t have the advantage that I do–of being able to look at the real world and see the lie this is reinforcing. National male/female ratios on college campuses today are far different from 30 years ago–colleges average 57% women and 43% men since about the year 2000 (“The New Math on Campus”). Women are advancing in all fields of study. Medical schools routinely enroll 50% or more women with each class. Women serve on the Supreme Court, as Secretary of State, as leadership in public office and in boardrooms, classrooms and research labs nationwide. They didn’t get there by not doing book reports, science projects or math. I like this ad as well. There is no objectification in it. Folks need to loosen up a wee bit. This was not the ad in question, though I’ll be honest that it seems a kind of weakness to be begging for acceptance and allowance to play. As you say below…tell the men who keep you out of the game to stick it. That’s the one. Here is another Nike ad–talk about objectifying body parts! As any star athlete will tell you, be they a football player or a Judo master, if you’re thinking about the other stuff going on in your life, you’re not going to focus and get in the zone. Which means you’re not going to win (and you may even be a hazard to your teammates). Kids let go of their obligations and stressers so they can play better (and adults play so they can let go of their obligations and stressers). This slogan would be just as appropriate on a boy’s t-shirt. As for Nike, it has a long history of the social-activist equivalent of greenwashing. As in, tricking minority kids into buying things they can’t afford by convincing them that this is empowering. They’re general sleazebags, not misogynistic sleazebags. To be sure, the post referenced more than the Nike shirt; tag lines for which you’ll have a harder time finding the message ambiguous. I like that ad! Thunder thighs is not meant as a put down… nor is tomboy knees. My shoulders look like a mans is not a put down either. Of course this is coming from a tomboy that swims every day lifts weights and power trains. I fit the description. Although, I am also an engineer so I had to study as well. We need to let girls know it is okay to be intelligent and athletic. We need to be able to tell men to stick it and back it up with the directions on how to stick it. Clearly this shirt is instilling boys with the idea that domestic violence is ok, and that they should beat women if they don’t “cheer” enough. Boycott Nike! Imagine that all advertising were so benign and that no harmful messages were ever propagated through their endless repetitions. will think of your outfit. jokes and pretend they’re funny. if you’re not wearing lipstick. Stop looking for reasons to whine where there are none. The ad isnt misogynistic. Its just saying that when its time to cheer the girls cant forget about everything else that stresses them and just enjoy cheering. Let’s agree the message can be read that way and perhaps should be. What about the other tag lines on offer from other companies that were mentioned? Awesome article and you made it to fark, too (yay). The mixed messages sent to girls in middle and high schools, along with the mixed interpretations, do not reflect the current reality. Girls are flat-out schooling boys in school. Yet, walk into any classroom and it’s the boys doing all the talking and disrupting along with the handful of self-exiled ditzy girls. The template hasn’t changed from years prior, but the results sure have. A great frame, Ms. Liakos, and consider this educator a new fan! Well, Nike has a long reputation of offensive ads, so I guess I’m not surprised by anything they do. Fifty-five years ago when I was in high school our coaches made it very clear that football – basketball – track – cross country – etc. were all far more important than any academic subject WHILE YOU WERE ON THE FIELD. My teenaged son’s coaches made the same point. Does that mean they were sexist? Anti-academics? Of course not. They merely wanted athlete’s concentration to be totally on the sport for the time they were involved with it. Nike does not intimate the youth, female and male, who lead cheers should only participate on the sidelines. 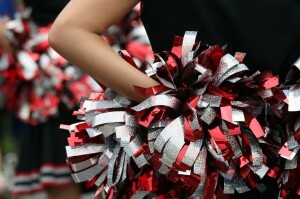 Those who cheer are quite able to choose to play rather than cheer. But when they are leading the cheers, that’s where their mind should be. Not worrying about academics. Stop looking so hard for things at which you can be offended, stop making mountains out of molehills. Get a life. Ron, you almost left a thoughtful reply if we forgo your assumption of knowing the “mind” of Nike. However, you ruined it by being disrespectful which seems to be acceptable in this invisible realm. The post did not only address a single t-shirt however and we might ask you to consider these other tag-lines and think if they might be sexist or harmful before berating us for trying to think about the consequences of advertising on our children and culture. If telling people to stop looking for excuses to be offended is being disrespectful, so be it. There was nothing in either what Nike presented either on the t-shirt or in the video posted that I saw as sexist. It is my considered opinion that almost all material seen as sexist, racist, etc. is that only in the mind of the observer (note the word ‘almost’ in the forgoing sentence). Given that, there is no way to present any material such that it will offend nobody. The only answer is for everyone to take two or three looks, and only then comment. As for knowing the mind of Nike, wasn’t that what the author of the original article claimed? Do you accept that she knows Nike’s mind? If so, why accept her perception and not mine? “Get a life” is disrespectful and impolite and what I was referring to. Your response to me–man to man as it were–acknowledges this by being respectful in its presentation and I appreciate it very much. The rest is of course valid and I’d have to say that as far as the Nike ad goes, sensible. The author found the phrasing sexist and didn’t claim to know Nike’s intent (to be sexist?…no, to sell shirts). Again, your perception of that ad is likely closer to the Nike “brand” character that the author’s. She questioned the particular choices of subjects as being representative of a certain stereotyping of girls and their mental prowess. The Youtube ad I posted wasn’t sexist in the same way. To me, it is “pathetic” to beg the male-dominated power structure to “let” girls play their boy games. But that’s just my opinion and as you say no more valid than any other. And in the post Liakos points out tags for a JC Penny brand shirt and another company. One “Allergic to Algebra” (specifically marketed to girls via color scheme) is right on the money in the stereotyping of girls in school; the other is “I’m too pretty to do homework…” and again this is hard to dismiss as not “purveying” a sexist stereotype any way you parse it. Thanks for visiting us and thanks for the dialogue, Ron. Douglas, you’ve made this point in reply to several people I see. The issue with your claim that they shouldn’t focus on the Nike shirt is that the article, from headline on down, focuses on the Nike shirt! Others are mentioned to give it more credibility, but the focus of the article is on Nike practices, history, and profits, not JC Penny or Forever 21. The claim is that a company profiting off women’s athletics is being sexist; no claim is made that a department store or clothing store is profiting off sexism. So if you feel people are wrong for defending Nike as that isn’t the point of the article, then ask Btown to change the article to focus on the more-offensive shirts and downplay or entirely remove the Nike reference. In my view, this article is an “attack” on Nike for a tag-line that, as others have pointed out, is equally applied to other sports and for men as well. It is harmless and the author here is twisting it in to something far worse by lumping it together with actually-aweful tag-lines from other companies. Hey, Jeff, thanks for the response. That seems reasonable. However, I think the ambiguity of messaging does create the “mixed” message…if you don’t know the “brand” character there is an easy “misunderstanding” to be had by the language offered. Especially seen in the context of advertising generally which one has to admit doesn’t win humanitarian awards for message content. Nike earns its share of derision in any number of ways. I read it as an attack on the cultural norms. Yeah,because lord knows, if the cheerleaders don’t cheer right, the team loses the game…pffttt..anyone who lets their daughter do that needs to have THEIR head examined. Becuase cheer ‘anything’ looks SO go on a resume in today’s REAL WORLD. Well, Bubba, you must be aware this is not the point of the post. And I sure hope kids don’t think about doing things they like in order to put them on a resume. That is exactly what we need to be re-thinking. The other shirts (by Penneys and Forever 21) have been pulled from most outlets or their websites. Obviously enough people saw the message as a step backward. While there may be other interpretations to the Cheer shirt, I still take issue with the suggestion that a child’s emphasis should be on sports. When we have a shifting economy and more high tech jobs than Americans are capable of filling, we need to stop giving our children the idea that being a high school football or basketball star is anything other than an extracurricular. Living in Nebraska, I’m amazed at the Sunday newspaper sections dissecting the performance of a few college players, as if the pride of the state depends on it. How about we make sure they have a firm basis in math and science and find a way to move our country ahead in 21st century? I was a girl interested in science and math who also loved cheering. I got a degree in engineering, I went to med school, I danced on my cheer/dance team in high school, I participated in sports, I still do it all. I don’t think the Nike t-shirt slogan is appropriate at all. I find it offensive. I can do it all. Isn’t the Nike slogan “Just Do It”. Shouldn’t that mean do it ALL? The point of the article above by Photine Liakos is that the t-shirt slogan is NOT encouraging girls to do thing like math and science and book reports AND cheer. It is telling them that what is important is cheering. It is says “NO science, NO math, NO book reports. Just cheer.” Shouldn’t girls (and boys) be encouraged to do science, math, and reading as well as extracurricular activities. The slogand should have said something like “I rock science, I knock out book reports, I kill math, and I cheer.” What is wrong with a positive message. Why make it negative? Mixed messages may sell products in the short term, but will damage brand over the long haul.This campaign flies in the face of Nikes CSR Project partnership on The Girl Effect, where they are trying to change the lives of Millions of girls around the world through…..wait for it…..EDUCATION. Yes, on one hand Nike is promoting education for young girls as a life altering opportunity. This message is for the socially responsible consumer. ON the other hand, as evidenced here, Nike is promoting a gleeful disregard for the benefits of education in a girls life….this message must be for the bonehead consumers. Really Nike, which one of you do we believe? As the mother of daughters, I respect that you are insulted by the potentially negative commentary that you gleaned from the ad. I have spent all of my girls’ lives encouraging them to work hard at whatever they do and they can achieve great success. I don’t like to get too ‘gender specific’ when pressing this point to them, because I feel that when you say “AS A WOMAN” you can do this or achieve that, because that infers that there is a difference between women’s and men’s abilities and possibilities … and I do not want my daughters’ to think that way. NOW, as the mother of a cheerleader … I’ve gotta just insert my 2 cents worth in here … (First of all, let me digress and agree with one of the previous comments … I think that Nike could indeed have included a lot of other sports to their final line on the tee shirt … “Just Soccer” “Just Tennis” “Just Track” … given that you and I are wired differently, I would have never looked at that tee shirt and assumed that Nike was subliminally attempting to ‘sideline’ my daughter.) One of my daughter’s CHOOSE to take on cheerleading long ago, after taking stabs at Track and Field, Basketball, Softball, and Soccer. Cheerleading is what gripped her, early on, and she’s run with it ever since. She does what she does for her own gratification, and not in hopes that SHE gets cheers from adoring fans. I am so very proud when I look at her each Saturday afternoon now in college, confident, happy, enjoying what she does so well, displaying as much athleticism as participants most other sports do, on a field cheering to 82,000+ people, for a team that she loves. When not on a football field, she represents the spirit of the university she attends at basketball and volleyball games as well as at other special events. And after she is finished cheering for others, those others are cheering for her as she and her squad, after months of grueling and time consuming practices, participate in national competitions. She has done this since she was in the 4th grade and has just started cheering for the second year in a row in college … not an easy, or pain-free feat. SO, if Nike did indeed single out “cheerleaders” on the tee shirt you saw, I”m here to tell you, that’s not the degrading thing as you are thinking it is.